Flavors and fragrances are integral components of a wide range of consumer goods. Natural and synthetic flavor compositions are responsible for the fruity taste of cherry cola and the cool mint flavor of toothpaste. Fragrance compositions add the fresh scent of pine to household cleaning products and exotic top notes to fine perfumes. Worldwide consumption of flavor and fragrance (F&F) products—flavor and fragrance compositions as well as the essential oils, natural extracts, and aroma chemicals that serve as starting materials—amounted to almost $40 billion in 2018 (merchant sales of F&F products only). The use of aroma chemicals (which are primarily synthetic) has increased at the expense of essential oils and extracts of natural origin. Synthetic aroma chemicals generally offer security of supply and price stability, whereas essential oils and natural extracts can be subject to supply shortages and price volatility. Mature markets—North America, Western Europe, and Japan—accounted for less than half of 2018 consumption value; developing markets—Latin America, Central and Eastern Europe, the Middle East, Africa, China, and Other Asia—made up the remainder. Analysis of global consumption by product category over time shows that the use of aroma chemicals (which are primarily synthetic) has increased at the expense of essential oils and extracts of natural origin, despite increased consumer interest in natural ingredients. 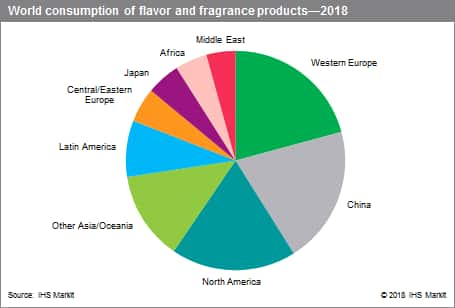 Sales of flavor compositions generally exceed sales of fragrance compositions; in Other Asia, however, the opposite is true. Sales of aroma chemicals typically exceed sales of essential oils and natural extracts; in Japan, sales of essential oils and natural extracts exceed those of aroma chemicals. Japan’s consumption of fragrance compositions is much smaller than its consumption of flavor compositions, and thus demand for aroma chemicals—the raw materials for compounded fragrances—is smaller. Consumption of F&F ingredients (essential oils, natural extracts, and aroma chemicals) is comparatively low in regions that are strongly dependent on imported flavor and fragrance compositions, such as Central and Eastern Europe, the Middle East, and Africa. Worldwide consumption of F&F products is expected to grow at an average annual rate of about 3.5% over the next five years. The potential for growth is greater in China, Other Asia and Oceania (especially India, the Philippines, and Thailand), and the Middle East than in the comparatively mature markets of North America, Western Europe, and Japan. GDP growth, urbanization, the expansion of the middle class, and increased demand for consumer products will drive consumption growth in developing countries.